When my oldest grandson was five years old he was quite the reader. He was really quite effective at sounding out words and enjoyed being able to sit down with a book and read what all those words hade to say! This of course, made me a happy grandma as I want my grandsons to love reading! It also gave me some unexpected opportunities to see how my grandson thought . . . and a few good laughs as well! One day we were at the store with him and saw a plaque with an "interesting" saying on it. I held it up for him to read . . . which he did. 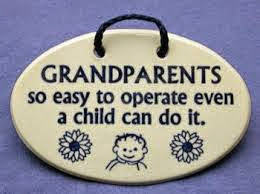 The plaque said, "Grandparents; so easy to operate even a child can do it!" My grandson read it and then said, "This is true! At least for grandma, that is! All I have to do to get what I want from you is to look cute and be polite!" While I knew he had me firmly wrapped around his little finger, I didn't realize he thought it was "that" easy to "operate" grandma! For the record; I do say, "no" if I have to, but if I do not have to say, "no", I do not because, well . . . I'm grandma . . . and apparently I'm "easy to operate"! What about you? Are you, "So easy to operate!! "?